A few nights ago I was experimenting with polar alignment with my newly purchased copy of Alignmaster after I made some adjustments to my C6 SGT scope to minimize poor backlash. Alignmaster is best used in conjunction with a webcam for accurate alignment, although it can be done visually if no webcam is available. Anyway, after playing around with this and finding that I had greatly reduced the amount of backlash, this in turn gave much better polar alignment. 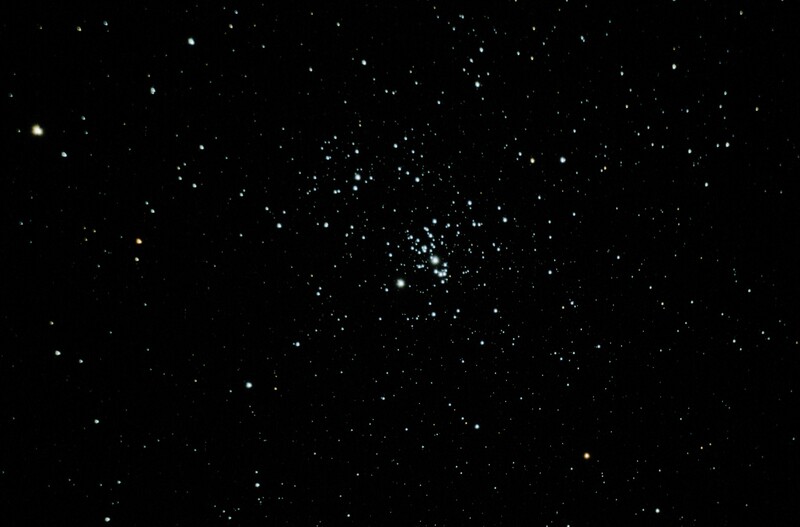 For a while I have been meaning to use my Canon EOS 600D DSLR to get a shot of Messier 13, the cluster in the constellation of Hercules, but since I had my LX-modified SPC900NC webcam already hooked up to the scope, I thought I would slew to M13, and see what kind of image I could get using the webcam before replacing it with the DSLR camera. 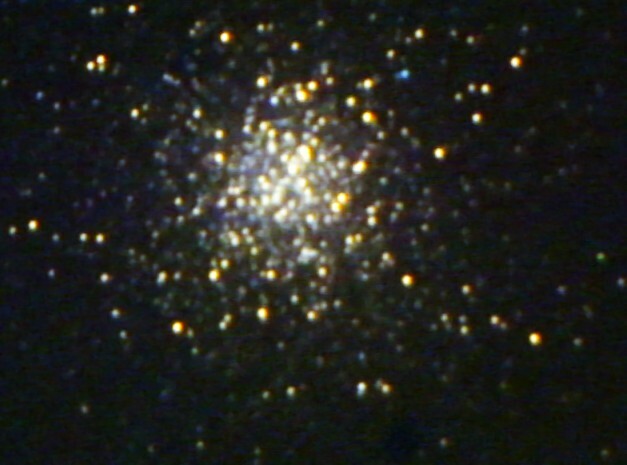 The resulting shot is a stack of 10 x 30 second lights (unguided) taken using K3CCD software with the webcam set to Long Exposure mode, and 5×30sec darks stacked and subtracted. Aligning and stacking was performed in K3CCD, and the final BMP image was saved at which point I tried Photoshop to process it. I wasn’t happy with the sharpening in Photoshop, so I started again with the BMP and this time post-processed using Nebulosity 3 to apply levels/curves, adjust background colour, sharpening with unsharp filter, plus Star Tightening filter and GREYCstoration noise reduction. I also attempted using DDP as an alternative to levels/curves, but this looked messy and over-processed. I much preferred the more natural look without DDP, although for some images DDP can work wonders. After taking the webcam images I went indoors to get the DSLR, but by the time I had removed the webcam, then connected the DSLR with T-adapter to the scope, plugged the USB lead to the laptop and fired up BackyardEOS, I looked up again and found that a light cloud covering had rolled in - those pesky sneakin’ clouds! So the comparison shot with the DSLR will have to wait until another night. Fairly recently I’ve started using EQMOD software with EQASCOM to control my Synscan Goto Upgrade Kit for my EQ5 telescope mount with my C6-SGT scope. There are various advantages to using EQMOD. It’s free for a start, but don’t let that fool you into thinking this is average quality software. EQMOD has quite a few nice features, and is designed for professional equatorial mount control and I highly recommend it. After some investigation (and it seems quite a few other people on forums get confused about what is possible) it turns out I am able to use the standard RS232 serial cable supplied with my Synscan Upgrade kit when the mount is set to use PCDIRECT mode. Normally I use this standard cable with a USB to Serial converter plugged into the bottom of the SynScan Hand Controller unit to allow planetarium software like Carte du Ciel or Stellarium to control my mount via the Celestron ASCOM driver. It turns out that EQMOD can also use this cable to control the mount. Well this would seem to be the logical conclusion wouldn’t it? Planetarium software can control it, so why not EQMOD too? This is where the confusion sets in! I really like Nebulosity 3 for processing my astrophotography images. The Help manual provided with the software is excellent, and the website provides very good tutorials which explain how to operate the software, and provides excellent detail to help understand all about Darks, Lights, Flats, Dark-Flats, Bias/Offset and BPM (Bad Pixel Mapping), not only what these things are, but when and how they should be used in the pre-processing stages. The manual then goes on to explain about the various tools available for post-processing the images. However, while it is quite necessary to take the time to read the manual to know what to do, and I have learned a tremendous amount by doing so, the manual is fairly long (it’s a good thing), I felt that it lacked a simple crib-sheet to remind you of the basic steps without having to paw through the manual over again…. For instance both the DEC and RA axis have quite a bit of backlash on my Synscan EQ5 mount (it needs adjusting) and because I didn’t give a bit of weight bias to make the RA axis motor work to pull the counter-weight “uphill”, so to speak, the gears were pushing the mount to a certain tipping point, then gravity caused the weight on the scope+camera side to “topple” downhill. This was only by the tiniest amount of the backlash distance in the RA worm gear as the RA mount gears teeth shifted between the worm gear teeth, but this was sufficient and regular enough to cause all the stars to suddenly create a streak during the 2 minute exposures I was using for this image. I didn’t realise this until the next day when I went to process the images. Here is another image I took while at the Kelling Heath Star Party 2012. Sorry! It’s a bit disappointing. 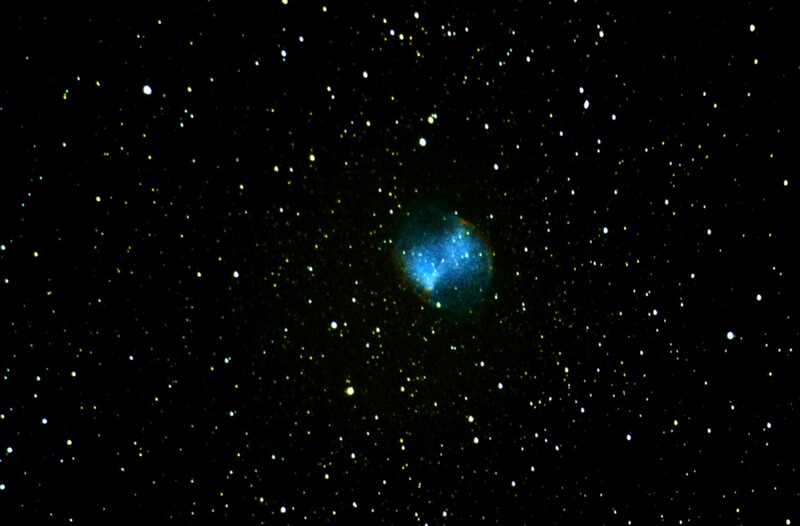 I chose NGC 6888 The Crescent Nebula as a possible try with my Canon EOS 600d DSLR after reading the September issue of Sky at Night magazine, where one of the observing articles showed this as a likely candidate. 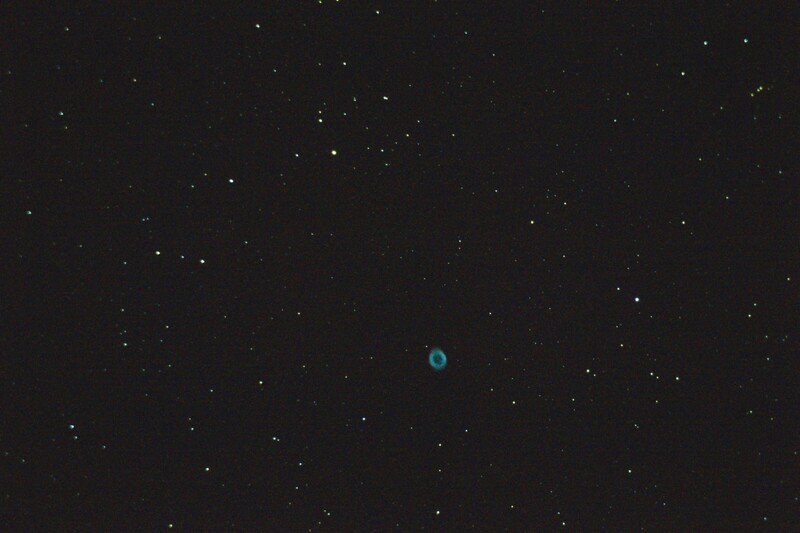 If you read my previous post you’ll know that on the same night I had lost M57 behind the trees, and so NGC6888 was next on my list. 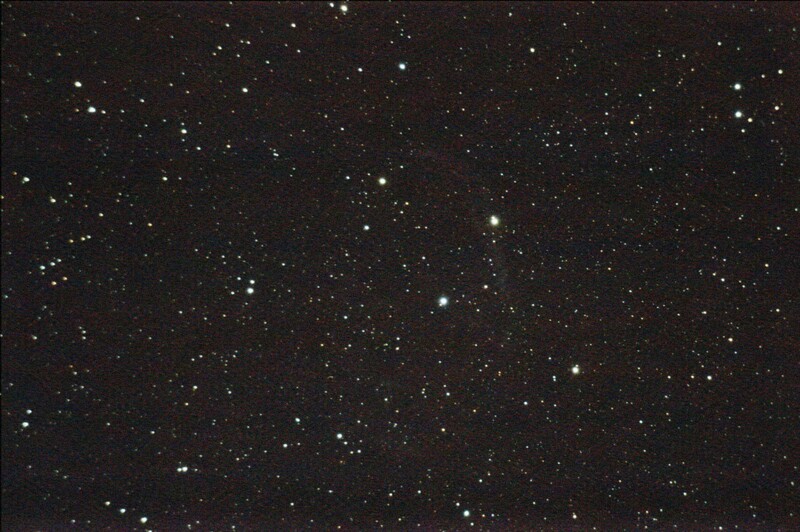 In the image to the right you can only just make out a faint wisp of the brightest part of the nebula (click the image to open it full size, then hit Back when done). You would have to compare it with one of the many other successful images of The Crescent in Google Images to see how it should look. After opening my .CR2 RAW images, then registering and stacking them the resulting image was a tall narrow rectangle. I also noticed that the image resolution sizes shown in the image list was 1336×3516, rather than the correct size of 5184×3456. After a bit of head scratching and Googling it turns out that the version of DSS I have (3.3.2) does not understand my Canon RAW format properly. This is because DSS decodes RAW files using the DCRAW library by Dave Coffin, and version 3.3.2 of DSS is built using an older version of DCRAW. So we’re back from our short caravan break to Kelling Heath in North Norfolk this weekend just gone, where the 2012 Autumn Star Party took place. I enjoyed 3 good nights of clear skies and stargazing, using a combination of my EQ mounted Celestron C6-SGT scope, my Orion XT10i and my 20×80 big binos, while my wife chilled out reading books, walking the dog, and cursing me when I rolled into bed at 3.30am each morning! This is the second year I have been to the Kelling Star Party, and it was good to meet up with familiar faces and friends made at last years event (hi Simon, Darryl and Keith!). This year I made more of an effort to go from one field to the other during the night time observing sessions (last time I stayed very much with my own gear, venturing only to neighbouring pitches). I thoroughly recommend taking the time to do this, as I learned a lot by chatting to fellow astronomers about their kit and asking for tips and advice. The majority of people are more than happy to talk about their passion and show what they are doing or share the view through their eyepiece. It’s one thing to drool at all that lovely kit during the daytime, but even better to see it in proper use at night! Looking through the giant dobs was amazing. As explained in a previous post I recently got a new Canon EOS 600d DSLR and I wanted to try it out, but was a little vague on how I should set up the 600d camera for astrophotography, and what software I should use beyond that supplied with the camera (namely EOS Utility, Zoombrowser EX and Digital Photo Professional). By talking to people I learned that I should try about ISO 800 (or ISO 3200 to bring enough light for previewing in Liveview for focusing on dimmer objects), and that with my CG5 EQ mount I could probably manage between 30 seconds to 1 or 2 minute exposures, but not really much longer because my mount is not autoguided yet. But we are booked for a Norwegian cruise holiday early next year, and wanted a good quality camera to use on the trip and to get some shots (hopefully) of the Northern Lights aurora, so we splashed out and got the 600D. I am very pleased with it, and staggered by the features it has. So far I have attempted some wide view shots of the night sky, with 30 second to 1 minute exposures, which give a good idea of the sensitivity of the camera, but of course result in trailing of the stars. I’ve got a small motorised EQ tripod mount which a friend lent me (cheers James), and I will be having a go with that soon. Also I have ordered a Canon EOS (AF) compatible T-ring adapter plus a Celestron SCT T-adapter to mount the camera directly to the backplane of my C6-SGT telescope. And I will probably also order BackyardEOS to assist with focusing and taking sequences of images. All good stuff to look forward to, particularly when we go to the September Star Party at Kelling Heath. Tomorrow Friday May 25th the new Dragon reusable space craft developed by SpaceX will rendezvous with the International Space Station to provide new supplies, spend approximately 3 weeks docked with it, and then return back to earth. 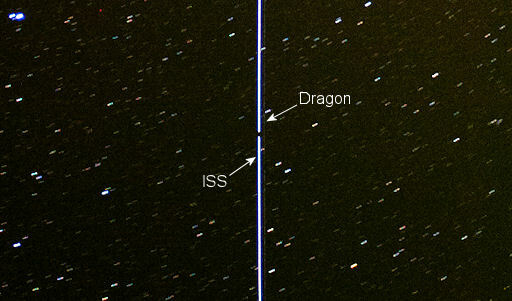 It has been possible to photograph the Dragon nearing approach to the space station, as shown in this picture. The two streaks across the picture are the paths of the two craft across the night sky, one bright, the other quite faint. This historic occasion marks the first docking of a commercial space ship with the ISS.